Actor, playwright, director, producer, scene designer, technical director, professor, scholar, outstanding teacher, department head, and advocate. Dr. Paul Siddens, the recipient of the 2018 Iowa Communication Association’s Citation Award. Dr. Siddens has always believed in the mission of the Iowa Communication Association (ICA). He worked tirelessly as Member-at-Large, Business Journal Manager, Iowa Journal of Communication reviewer, Vice-President and President of ICA from 1992-2000 to change the format and program of our state association to match that of Central States Communication Association (CSCA) and National Communication Association (NCA). This format is still used today. While ICA President-Elect, Siddens worked with Steve Palmquist and graphic designer Osie Johson to formalize the association’s logo, which is still used today. Siddens also redesigned ICA’s program to look more consistent with Central States’. He also worked with Al Lernstrom and Dennis Doyle on the States advisory committees (i.e., Central States and National Communication Association) to communicate and emphasis common areas of interest between the professional associations. This association led to increased communication between the state, regional and national associations. Dr. Siddens was elected to be the Vice Chair of the Central States Advisory Committee, which is a NCA body that formed from these connections. Dr. Paul Siddens is currently the Head of Department of Communication Studies at the University of Northern Iowa (UNI) where he also acts as the technical director of the Interpreters’ Theatre. As a faculty member in the area of Interpreters’ Theatre studies, Dr. Siddens produces and directs the work of colleagues and students. While at UNI he has written approximately 6-8 plays, produced approximately 60-70 plays, and provided tech for 100’s. He does this because these plays give voice to his colleagues and students. He believes social justice in this world is essential. Giving voice is why Dr. Siddens is so dedicated to ICA. This organization gives voices and connections to K-12, community colleges, colleges and universities here in Iowa. Siddens said, “I had really good mentors in graduate school. They were role models for being good human beings and they supported me personally.” He went on to say that it is a privilege for him to meet the K-12 and community college people and hear their stories and how they relate to their students. Siddens said this is why it is so very vital that ICA continue to exist. It is crucial to support K-12, community colleges and universities. It is the job of all of us here at ICA to advocate for them. As we present the Citation Award to Dr. Siddens, let us remember, this is not the first award he has received from ICA in 1994. Paul Siddens was the very first recipient of ICA’s Outstanding New Teacher Award! Dr. Paul Siddens is first and foremost a kind and giving man. He is an advocate for his students and colleagues. He is a scholar and professor. And now, he is the 2018 recipient of the Iowa Communication Association’s highest award — the Citation Award goes to Dr. Paul Siddens! Adjunct faculty are often under recognized and under appreciated although they are no less important or less influential. ICA chooses to recognize the professionalism, superior teaching, and commitment of these individuals. 2018 Adjunct of the Year Sherry Berghefer and ICA Past President Kim Powell. 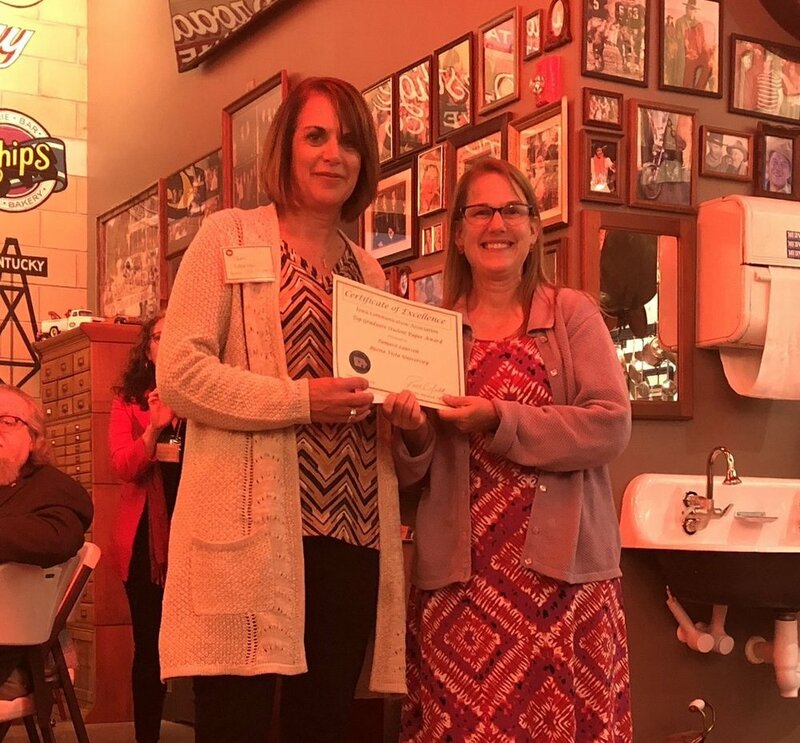 The Iowa Communication Association Outstanding Young Teacher Award is given each year to an exceptional teacher in the state of Iowa that is has been teaching professionally for seven years or less. 2018 Award recipient Brian Pattie and ICA President Linda Laine.